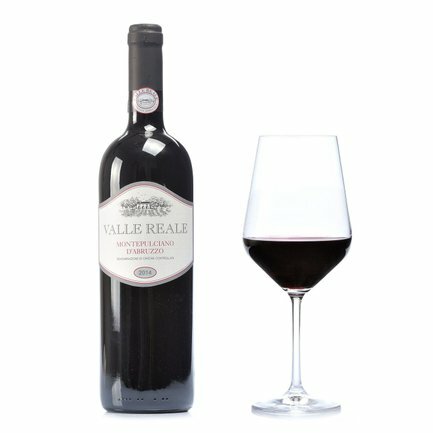 This Montepulciano d'Abruzzo by Valle Reale begins life in the company's oldest vineyard, making it a real "sip of history". Ruby red hues shimmer with almost purplish tints, as it diffuses mineral aromas of graphite, with black fruit and balsamic accents. In the mouth it is smooth and enfolding, with moderate tannins. This grape's typically acidulous inclination donates freshness and a pleasing drinkability. Ripe fruity sensations bring its finale to a close. Savour the flavour together with grilled meats, preferably pork or lamb. But also with pungent mature cheeses like caciocavallo or sheep's cheese. Thanks to its geographical position between the Gran Sasso National Park, the Laga Mountains and the Majella National Park, Valle Reale is an authentic expression of a truly green and natural territory, as yet mostly uncontaminated. This is where the story of Montepulciano d'Abruzzo begins and where Valle Reale creates wines of distinctive elegance and complex aromatic profiles.